Any way you slice it, American barbecue is one of the most debated food topics. Some will claim Kansas City or Memphis barbecue is the best. And states like Alabama, Texas and South Carolina always find their way on top 10 lists. But more people are adding Iowa to those lists. Or at least they will if Darren Warth gets his way. Sherry and Darren Earth are the only team to win the American Royal Open, Jack Daniels World Championship, King of the Smoker and the Houston Livestock World Championship. Warth, owner of Smokey D's BBQ in Des Moines, is familiar with all the arguments and best-of lists. But he says the best BBQ in the country is in Central Iowa, and he has the hardware to back it up. "I walk in every morning, and I just love barbecue. Barbecue is 100 percent of our life," Warth said. "I go barbecue to get away from barbecue. My relaxation time is sitting over a pit on a Saturday during a barbecue competition." That passion is paying off for Warth and his wife, Sherry. The duo is the only team to win the American Royal Open, Jack Daniels World Championship, the King of the Smoker and, most recently, the Houston Livestock World Championship. Add to that 82 state championships and 800 individual category awards, and you start to build an impressive resume that simply can't be touched by anyone else. "It’s a balance," Warth said while explaining why his barbecue is so highly rated by judges. "It’s meat, it’s smoke, it’s spice and it’s sauce. It’s not one of those things overpowering the other." In 2007, the former vice president of transportation for Ruan Trucking in Des Moines, walked away from a lucrative career to focus his full-time attention on championship barbecue competitions and a catering and takeout business. "It went crazy," Warth said of a catering and takeout business that started in his driveway in 2005. "I was on the road 60 percent of the time. I was traveling everywhere." That led the couple to open a location in the old Polk County Sheriff's building and eventually in the skywalk in downtown Des Moines. Today the Warths own three locations in the metro while still competing across the country in barbecue competitions. Those details paid off on the tournament circuit and for his restaurants. He is quick to say the quality of pork, beef and other meats are just as important in a barbecue contest as they are in his restaurants. To do that they use meat suppliers like Smithfield when purchasing their meats. "We look for a heavy meat cover on ribs with as much marbling as possible," he said. "That ensures it will be a juicy product at the end, whether you are cooking for judges or customers." Smokey D's business received a boost when famous food "judge" and traveling customer Guy Fieri, host of “Diners, Drive-Ins, and Dives,” featured Warth's wings on his television show. Warth said even though Fieri featured his wings, most customers know Smokey D's for their ribs and burnt ends. Any given day, Smokey D's will serve up barbecue to thousands of people. They’ll typically sell about 1,200 racks of ribs per week and serve 125,000 pounds of pork and beef per year. "We have a weird demographic," Warth admitted. "You have grandma and grandpa sitting here and next to them is a Harley rider with tattoos down his arm and a screaming kid across the way. And it doesn’t seem to bother anybody because it is Smokey D's." Over the past decade, Warth has built a business and championship pedigree that is tough to beat. Those endeavors paired with other fantastic barbecue restaurants across the state have put Iowa barbecue on the map. Is it the best? It might be a solid claim for one of the most-debated food topics. One way to find out is to try Smoky D’s for yourself. For locations and other information, go to www.smokeydsbbq.com. 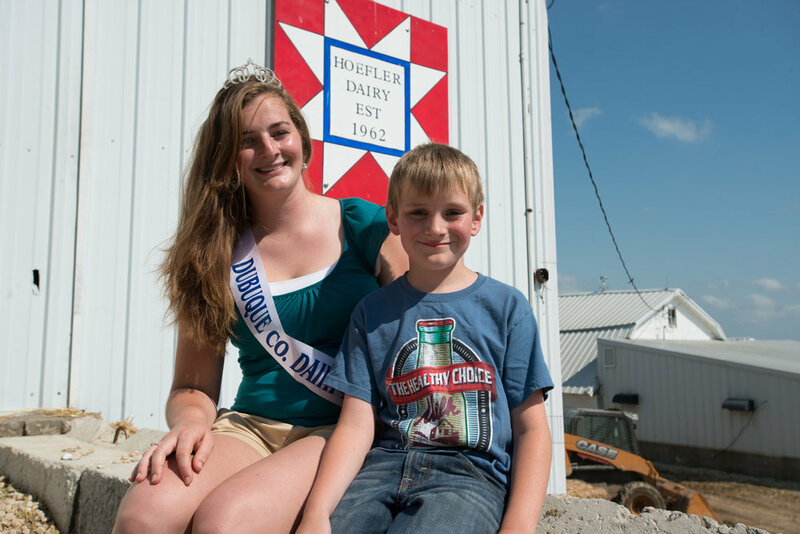 Waterbeds, ice cream and family — All in a dairy tour! Participants of the Iowa Grocery Industry Association (IGIA) annual meeting had the opportunity to tour two Dubuque County dairy farms Tuesday and learn more about where their food comes from. 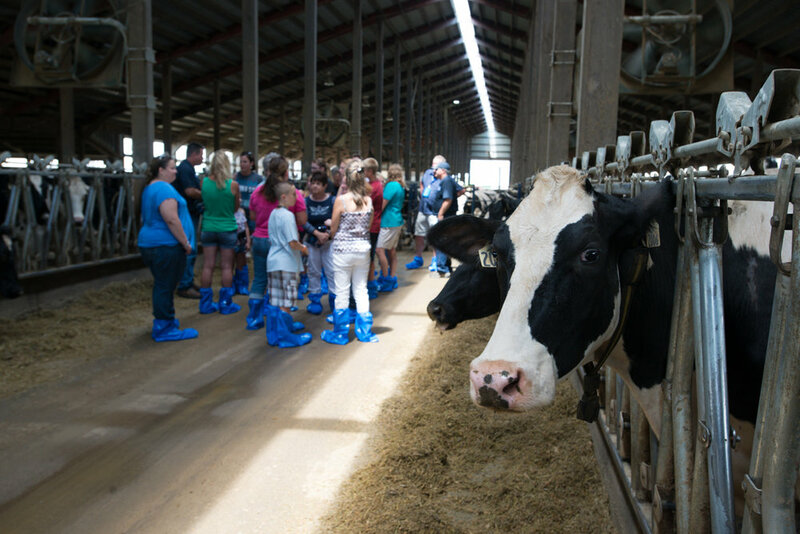 The tour, sponsored by the Iowa Food & Family Project along with Midwest Dairy Association, gave 20 visitors the chance to tour milking parlors, touch newborn dairy calves and learn more about milking robots and the future of dairies in Iowa. The first stop on the tour was at the Reuter Dairy near Peosta. The family-owned dairy milks about 850 cows and produces about 2.7 million gallons of milk annually, according to Rick Reuter. The family prides itself on not only producing healthy, high-quality milk, but in making sure that the cows remain comfortable year round. The IGIA is a partner of the Iowa Food & Family Project and the tour allowed grocery leaders to gain a better understanding of farming. Gary Munson, a representative from Kellogg’s USA, jumped at the chance to take the tour after watching a program on Iowa Public Television about a large dairy in Indiana. The second farm the group visited was at the Hoefler Dairy near New Vienna. 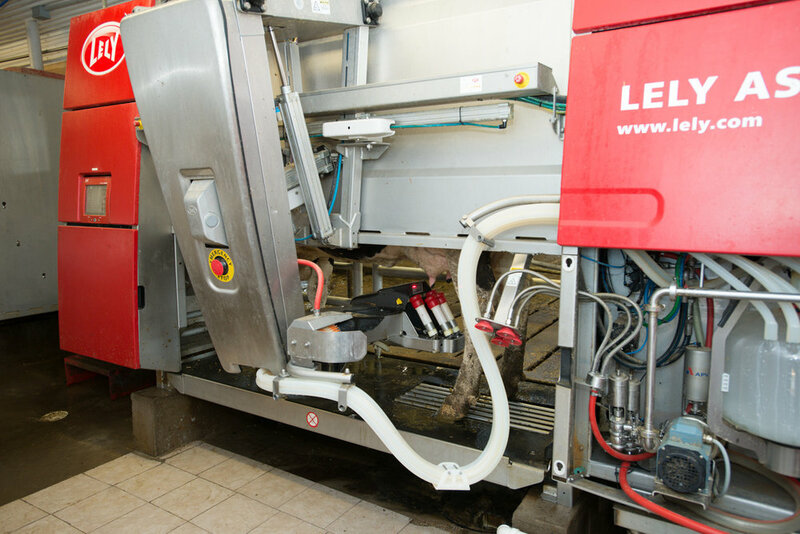 The family-owned dairy began in 1962 and sets itself apart by using three robotic milkers. The milkers allow the cows to decide when they want to be milked, which is usually three times a day. 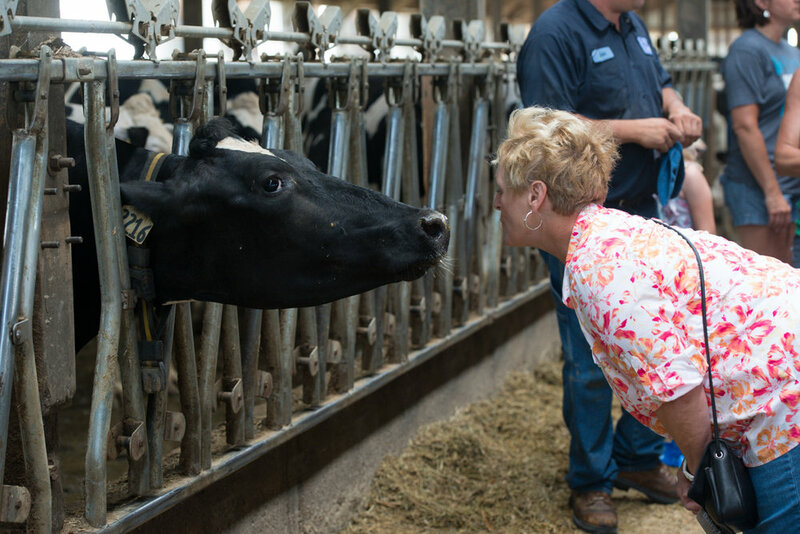 “If the cow feels the need to be milked, she just simply walks to the robotic milker,” Joan Hoefler explained. housed in free stall barns equipped with waterbeds and mattresses for the cows to lie on. The cows also have constant access to food and water. Heidi Boehme, who grew up on a farm, attended the farm tours with her children to show them how farm families work together. The tour ended with participants talking with the dairy farm families while enjoying fresh ice cream.